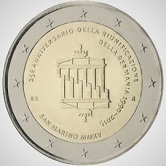 Details relating to the San Marino Commemorative of 2015. This coin celebrates the 25th anniversary of German unification. The motif shows the Brandenburger Gate in two sections, one the mirror image of the other but slightly offset with the columns interlocking, this symbolizing two hands shacking - i.e. the two Germanies coming together. Around the edge of the inner circle from nine to three o’clock is the inscription ”25 ANNIVERSARIO DELLA RIUNFIFCAZIONE” and then slightly in from this a second inscription ”DELLA GERMANIA 1990-2015” – together these read “25th anniversary of the reunification of Germany”. From eight to six o’clock is the name of the issuing country and the year in Roman Numerals – SAN MARION MMXV. The mint mark is between three and four o’clock and the initials of the designer “ES” are between eight and nine o’clock. Return from San Marino Commemorative 2015 to euro coin collector.